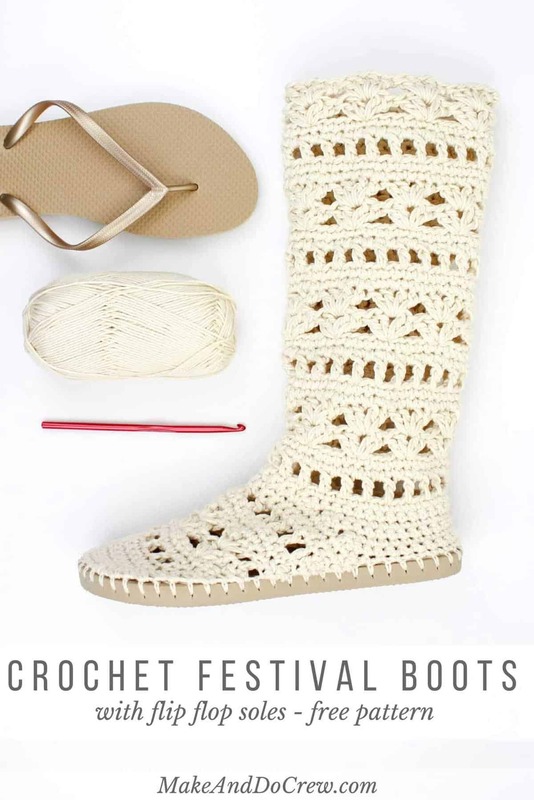 Whether you’re headed to Coachella or your local concert in the park, this crochet boots pattern for adults will complete your boho-inspired outfits all season long! The free pattern is below or you can purchase the ad-free PDF with printable hole-poking guide for $2.75 here. If a gladiator sandal and a Fry boot had a baby, I think it might look something like these Coachella Boots with flip flop soles. 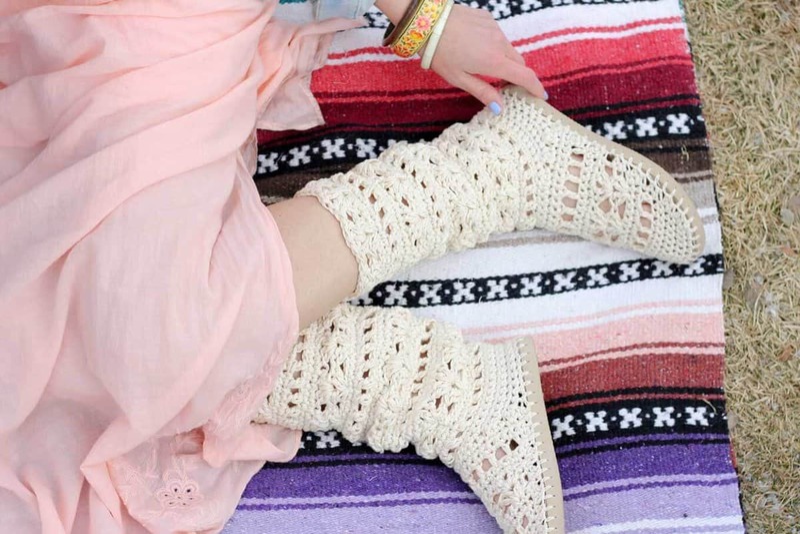 They’re airy and lacy like crochet sandals, but they offer the style impact of boots. Sounds like a win to me. While I won’t be dragging a double stroller and 9,000 sippy cups to Coachella this year (you’re welcome, carefree 20-something festival goers), I can still channel the vibe my designing my own boho crochet patterns. 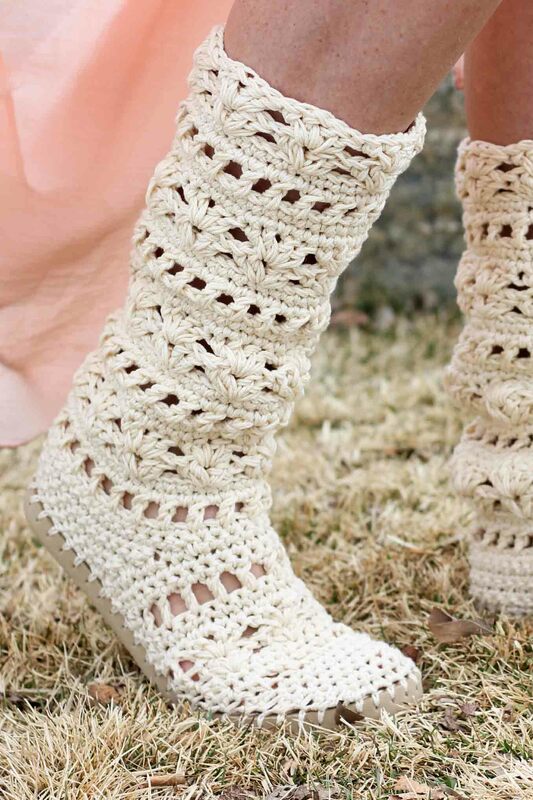 This crochet boots pattern for adults is meant to nurture the free spirit in you, even if that free spirit is obligated to arrive at work at 8:00am tomorrow. 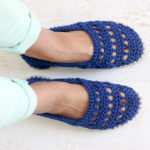 Here are some of my free crochet shoe patterns with flip flop soles. You can always find them all here. 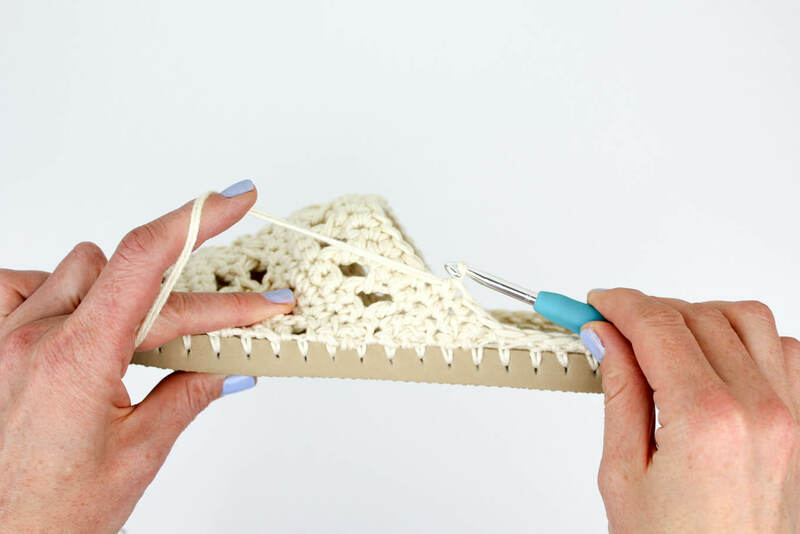 The trickiest part of following a crochet flip flop pattern is achieving the gauge, since it’s so dependent on how far apart you poke the holes in your flip flop sole. That’s why I’ve started including “rulers” in my printable patterns that take all the guesswork out of spacing your holes. The printable pattern is also handy because it has all of the instructional photos separated from the written pattern so you can choose to print them or conserve ink. You can purchase the Coachella Boots ad-free, printable PDF for $2.75 here. This particular crochet boots pattern fits adult sizes 5-10, but you can make bigger sizes by just working a few additional rows at the end of the “boot foot base” section of the pattern. I’m always thrilled when you customize my patterns to fit your needs and body, so feel free to experiment! Thanks to Lion Brand Yarn for sponsoring this post and enabling more free patterns on Make and Do Crew! Purchase the ad-free, printable PDF with hole guide here. 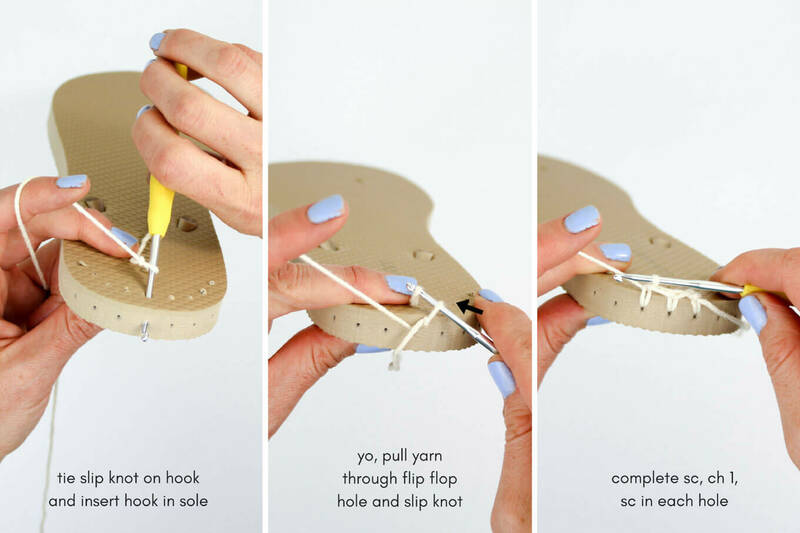 Transforming flip flops into slippers isn’t an exact science! Unlike other crochet patterns, these slippers have some variables. Keep an open mind and don’t be afraid to customize the boots to your liking. Check out this Flip Flop FAQs post for answers to commonly asked questions. You’ll likely want to size down when buying your flip flops. Look for a flop flop that offers about .25″ of sole around your foot (more like the fit of a normal shoe). In the pattern sizing, the shoe sizes mentioned describe the shoe size you normally wear and not the sized-down size of your flip flops. The flip flops in the sample are from Old Navy–they have a great selection of colors. Find $1 flip flops on Amazon or at Walmart. Dollar Tree’s $1 flip flops tend to be a bit too flimsy, but can work if you are careful. And LionBrand.com now offers flip flops so you can get your yarn and soles in one place! 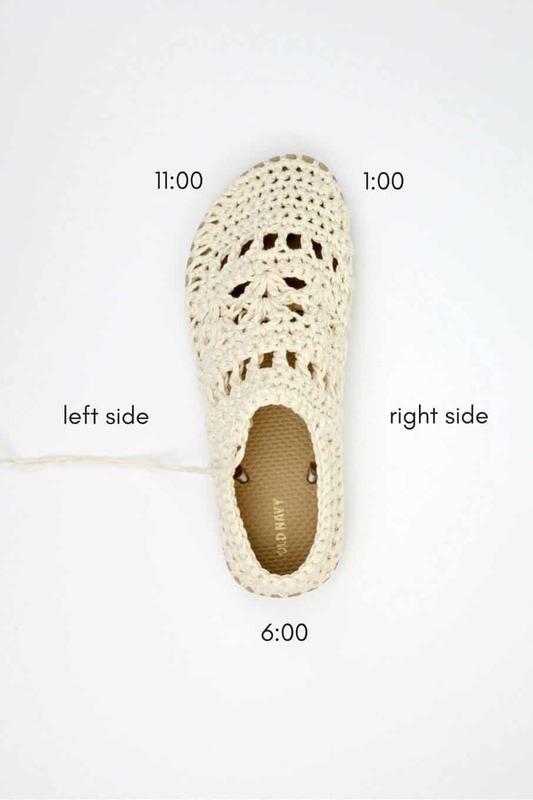 Pattern explains locations on the flip flop as if it’s a clock where the top of the toe is 12:00 and the heel is 6:00. See photo below. Pattern describes size small instructions with size medium and large in parentheses. Left and right boots are identical. The foot of the boot is crocheted tightly, similar to amigurumi. Make a deliberate effort to keep your stitches tighter than normal. Check your gauge if you’re unsure. When working sc2tog stitches on the sole, keep yarn fairly tight so as to create a smooth edge around the sole of the boot. It may take a couple of attempts to get the sc2tog stitch to look how you’d like it to. Pattern is worked with two strands of yarn held together throughout, except for the foundation round which is worked with one strand. Trim straps off flip flops. If you’d like to wear your boots outside, trim the mid-foot straps at an extreme angle so you can keep them in place without feeling them inside the boot. (See photo above.) Save the rubber plug from the strap between your toes. Print “ruler” on page 15 of printable pattern (optional). Trim, tape pieces together and tape ruler around flip flop sole. With your sharp instrument, poke holes in each dot on the ruler. (If you’re not using the printable guide, poke holes slightly less than 1 cm apart.) You want the hole to go at an angle from about the middle of the way down the sole to about .25” into the top of the sole. Ensure your holes are far enough from the edge so that the yarn won’t rip through the rubber when you create your first row of crochet. Reference the Breckenridge Boots video tutorial for help. Using one strand of MC, tie slip knot around smaller hook. Insert hook at back of heel (6:00 position) from the top of the flip flop toward the bottom of the sole, grabbing the yarn and pulling through to the top of the flip flop and through the slip knot to attach the yarn to the flip flop. See photos below. Foundation Round: Continuing with size B hook and single strand of MC, ch1, sc in each hole around sole, join with a sl st to first sc. Fasten off. You will work over yarn tails in the heel section of the pattern. Place stitch markers at 11:00 and 1:00 positions with 8 stitches in between. Using larger hook and two strands of MC, make a slip knot on hook. Insert hook at the 11:00 marked st of Foundation Round (1:00 marked st for left-handed crocheters), yarn over and pull loop through slip knot to join yarn at toe. Begin Row 1 in next st between markers and work over the tail of yarn you just attached. See photo below. Continue finishing top of foot section/beginning of heel according to the shoe size you’re making. Do not fasten off. Move on to heel section. Note: The next round continues onto the sole and back around the heel, ending with a slight overlap of where it began. See photo above. Row 2 (RS): Ch 1, sc2tog, sc in each sc around heel to left side of foot top; sc in next 3 st of Round 13 (15, 17); turn. Row 3 (WS): Repeat Row 1. Row 4 (RS): Repeat Row 2. Note: The next row is worked in a round, single crocheting in any remaining stitches from round 13 (15, 17) on the foot top . See photo below. Round 5 (WS): Ch 1, sc2tog, sc in each sc around heel to right side of foot top; sc in any remaining sc of Round 13 (15, 17); sl st into first st of this round to join. Fasten off. Place a marker in the first st of round if you find it helpful. Count your stitches around the ankle now. You’ll need 36 (40, 40) stitches at the end of Round 1. In Round 1, plan to work as many sc decreases (sc2tog) or sc increases (2 sc in one st) as necessary to meet the stitch count. Attempt to space them fairly evenly around Round 1. If you’re making a size S, but tend to have more muscular calves, you can work the size M/L ankle shaft by increasing until you have 40 st at the end of Round 1. Stitch count should remain consistent throughout. If you’re making a size M or L, but tend to have very thin calves, you can work the size S ankle shaft decreasing until you have 36 st at the end of Round 1. Using larger hook and two strands of MC, make a slip knot on hook. Insert hook at 6:00 position of Round 5, yarn over and pull loop through slip knot to join yarn at back of heel. Crochet over these yarn tails as you work Round 1. Continue with the shaft according to the shoe size you’re making. Round 3: Ch 1, sc 2 in first ch-1 sp, 1 sc in each dc and ch-1 sp around; sl st to join. Round 4: Ch 1, sc in each sc, sl st to join. Round 5: Ch 3, sk 2 sc, [(2 dc, ch 1, 2 dc) in next sc, sk 4 sc] 7 times; sk 2 sc, dc in last sc, sl st to join. Round 6: Ch 3, [(2dc, ch 1, 2 dc) in next ch-1 sp] 7 times, sk 2 sc, dc in last dc, sl st to join. Round 7: Ch 1, sc in first dc, sc in each dc and ch-1 sp around, sl st to join. Round 8: Ch 1, sc in each sc around, sl st to join. Rounds 9-22: Repeat Rounds 2-8 twice more. Rounds 23-27: Repeat rounds 2-6. Round 5: Ch 3, sk 2 sc, [(2 dc, ch 1, 2 dc) in next sc, sk 4 sc] 8 times; sk 2 sc, sl st to join. Round 6: Ch 3, [(2dc, ch 1, 2 dc) in next ch-1 sp] 8 times, sl st to join. Round 7: Ch 1, sc in first dc, sc in each dc and ch-1 sp, sl st to join. Plugging Flip Flop Holes: If you plan to wear your boots outside, replace the small rubber circle that connected your flip flop straps to the sole between your toes. Glue it in place. In my experience, the other two mid-foot strap plugs stay in place without glue as long as they’re cut at an angle like in the photo at the top of the pattern. Fancy Feet: Grab your favorite cutoffs and flower crown—you are going to be the belle of the bohemian ball! 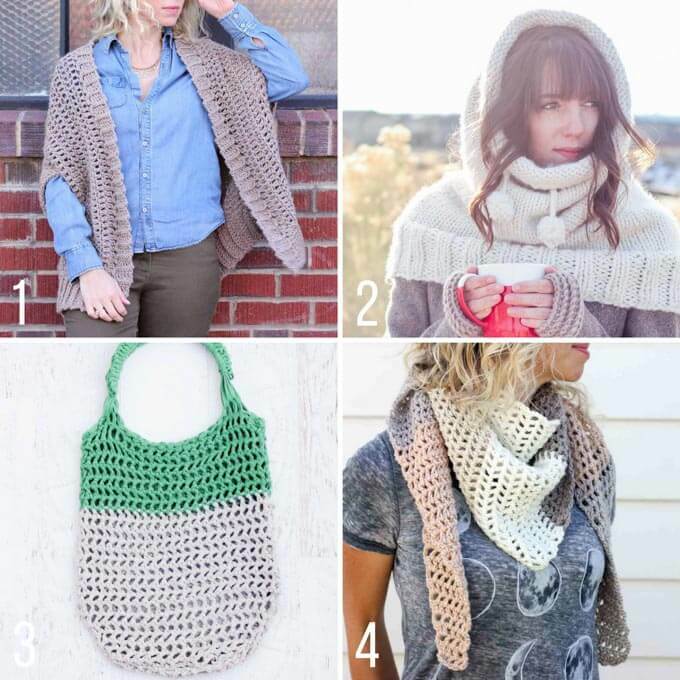 If you like the boho crochet and knit look, you’ll love these free patterns too! I just ove your designs for slippers,, shoes and boots using flip flops. I’m looking forward to seeing more designs in the future. Thank you for sharing your patterns with all the craftersin the world. My pleasure, Sandra! Thanks so much for saying hello! Would like the 4 free patterns……..No way to download????? I offer all my pattern for free on my site. I know many people like to download and print PDFs though, so you can purchase them here for $2.50 each. This small fee helps cover the operating costs of the site as well as the lost ad revenue when you’re not visiting the site to read the pattern. These would be great without the ankle shaft – just as plain shoes. They’re ADORABLE!!! And if you have already paid, but still haven’t gotten your pattern, please email me at Jess (at) Makeanddocrew (dot) com. I am having big problems trying to purchase the pattern. Is there another way to purchase? I emailed Jess and have not received any response in the past three days. I’m sorry it’s taken me a while to get back to you. I’m a one person show and sometimes struggle to catch ever email, especially over the weekend. I have switched the PDF pattern to a different vendor so I think you may have an easier time purchasing it now. Can you let me know if not and we’ll figure something out? If you’re interested in the printable pattern PDF, you can purchase it here for $2.50. This small fee helps cover the costs of the site and the lost ad revenue when you don’t visit the blog to read the pattern. I may do a video tutorial on this in the future if there’s enough interest. Shoe/boot video tutorials are pretty time intensive for me to create (about 40 hours to shoot, edit, upload, et), which is why I don’t make them for every single pattern. If there’s a specific section or question I can help clarify for you in the mean time though, I’m happy to do it! Oh please do a video tutorial, i am quite new to crocheting and find it easier to follow a video. The things you make are simply beautiful and i especially love these boots! thank you so much for sharing. I think the foot of this pattern makes a beautiful slipper also! when it says 2 sc on sole, is that 2 sc in one stitch or 1 sc in 2 stitches?? Thanks for letting me know you’d benefit from a video tutorial! It’s really helpful to hear. 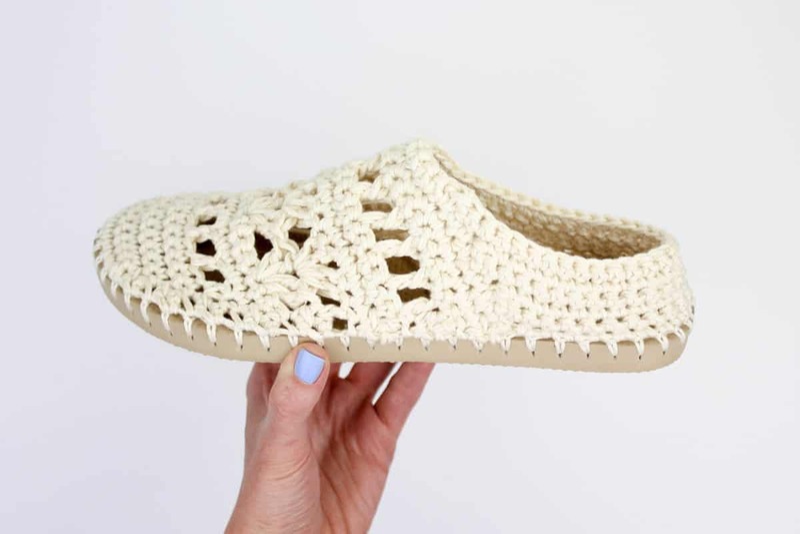 I’m wondering if this pattern, as well as your other flip flop shoe patterns, would turn out the same for a left-handed crocheter? I’m a southpaw and sometimes have difficulty with patterns coming out correctly. I love these patterns and would love to make a few pair to donate. I make items and donate them to a local animal rescue & sanctuary and they will either auction them off or sell them to support the animals. Thank you for offering it for free. I’ve never heard the term “southpaw.” Thanks for teaching me something new! I do try to include instructions for left handed crocheters in my flip flop patterns. I was a bit naive to this in my first few, but all the boot patterns definitely have left hand notes included. If there’s anything you run into that’s confusing, feel free to send me an email and I’ll try to help clarify. The animal rescue sounds like a wonderful cause to put your time and creativity toward! Can you give me an idea of a yarn substitute I really look forward to making these. Welcome 🙂 I bet you’re looking for my Cabin Boots pattern. It that’s not it though, you can scroll through that post and see links to my other flip flop patterns and hopefully find the one you need. great work and thats so kind of you to share your .#priceless.thank you so much greatly inspired we do this in africa but this is more stylish lol. Haha, thank you, Noriah! And hello from Colorado, USA! First let me say THANK YOU for such a fun pattern. And wow! Was it easy. I made a pair for a dear friend who is going through chemo and my 6 year old asked for a hot pink pair. So of course I had to make a kids size 11/12. I was able to adjust the pattern and they turned out great. Thank you again! I would love that, Misty! Thank you so much for the offer. I’ve been thinking that these would be adorable as kids boots. And I’m so happy to hear you enjoyed the pattern. I think your friend will really enjoy her boots as well. What a generous gift! Please feel free to email me at jess (at) makeanddocrew (dot) com. Can I have a copy? My 5 year old is watching me make these (just starting the ankle shaft of boot 1) and wants her own when I’m done mine! Hi. I just made your Coachella boots. They are so cute! It says that you can wash them? How do you wash yours? Thank you. Yay! I hope you enjoy them! I’d wash them on cold and delicate. Then if you’d like the cotton to tighten up a bit again you could dry them on low for a few minutes and then reshape the ankle shafts. Hi so I’m on round nine of ankle shaft and I’m doing small and they are still huge! I am more a petite person do you recommend maybe a smaller hook? This is very similar to the pattern I published 2 years ago on Ravelry! I do see some similarities. Your pattern is beautiful! I can honestly say I haven’t seen it until now. (I’d have no interest in duplicating someone else’s pattern. Other designers have done this to me and it’s crappy. I wouldn’t do it to you or anyone else.) I’ve been experimenting with flip flops for a while now and it’s so fun. I’m glad you enjoy it as well. Please stop saying “free” when there is a $2.50 charge. It’s not much, I know, but it’s NOT free. I see several others ran into the same confusion. It’s just irritating. I say “free” because the entire free pattern is included above. I spend about 40-50 hours developing, creating and writing each of these patterns. I share them in their entirety for free, but charge a small amount if people want a printout because I don’t earn any ad revenue when people look at a printout instead of the website. Sorry about that! The ruler should have been included. I just emailed it to the email address associated with this comment. Please let me know if you don’t receive it! I purchased this pattern and yarn through Lion Brand. It said it included the hole punching guide. It did not. I’m disappointed as I want to get started on this project today. Please send me the pdf asap. It should have included the hole poking guide. I hope you received my email with it? I’m checking with Lion Brand to make sure it’s included in the future. Sorry for any delay! Did you purchase the pattern and yarn through Lion Brand? If so, unfortunately the ruler was left out. They are correcting the pattern, but I’ve emailed it to you at the address associated with this comment. Please let me know if you don’t receive it! Hi Jess… am wondering about how these stretch out over time. Can you add a little elastic to the tops? Or are there certain yarns that may help them retain their shape over time? I actually find that this 24/7 Cotton holds its shape really well because it’s mercerized. It’s just a little less stretchy than other cottons. Also, the pattern is intended to be a little tight on your feet at first to accommodate a bit of stretch with wear. I have also heard of people washing the flip flop crochet shoes they’ve made to clean them and tighten them up again. I have ordered the pattern and yarn through Lion Brand and as stated above the ruler is not included. Can you please email me the ruler so I can start on this project? Would other types of worsted weight cotton work for making these boots? I bought 4 pairs of flip flops yesterday to make these boots and some of your other patterns (EXCITED!!!) Lion Brand 24/7 is not available in store at any of my local craft stores, although I discovered it on walmart.com and it might be in store. A.C. Moore had a great deal of 10 for $10 on the cotton yarn, and the colors match the flip flops really well. I just want to make sure a cotton or cotton blend that is not mercerized will work before beginning. Thanks for the awesome patterns and tutorials. I’m excited to begin poking holes in some flip flops! Mercerized isn’t mandatory either, it just makes them a little sturdier. I’m guessing the cotton you got though on the 10/$10 yarn is pretty sturdy too. I hope that’s helpful. Have fun! For the part that is double bracketed, is it supposed to be done in the next stitch AFTER the first dc? Or in the same stitch as the dc? I kind of had to guess my way through Row 11 as well…though I did find it was worded a bit better. I’m trying to look at the picture, and see if it’s turning out the same way…just frustrating to rip out a row a couple of times…im using a different yarn too, as I couldn’t find any 24/7 at any stores in my town. Any help would be much appreciated, thank you!!! ? I’m glad to hear you’ve gotten some use out of my patterns! The video tutorials are super time intensive (usually 30-40 hours to create), but I really wish I could make one for every pattern! I think I understand your question…let’s see if I do. 🙂 The (2 dc, ch 1, 2 dc) should all be done in its own stitch/space, which is the ch-1 sp. Essentially, you’re working (2 dc, ch 1, 2 dc) in each of the ch-1 spaces from row 11. I’m curious to hear how your alternative yarn works out. It would be great to know for other reader too. Hi, I just love your patterns!! I have been using the Cream and Sugar cotton yarn brand. My local stores don’t carry the Lyon Brand. Comparing the pictures of your shoes to what I have made, it looks like the yarn I use is somewhat thicker. Just wondering if I’m using a thicker yarn, should I just go with one strand of yarn instead to the two as stated this pattern? I would also lie to add my request for a video of this pattern. I find the videos really are helpful. Thank you for sharing your wonderful talent! Hmm. I’m not exactly sure about this. My guess would be to say use one strand because two might just be too bulky. I’d go with one and see how it’s going after the first 10 or so rows. (That first toe section is intended to be tight because it’ll stretch a bit with wear.) If it looks or feels REALLY tight though, you might want to size up your hook to get a similar gauge as what I had with two strands of 24/7 Cotton. Hope that makes sense. Good luck and happy crocheting! Thank you, Jess. You are right. I tried using two strands, but it was rather bulky, so I redid it with one strand. It looks much better, but as you stated it’s a bit tight. I will try using a larger hook for the next pair. The yarn I used was a variegated light turquoise/green/blue combination. They turned out so great. I have also made two pair of the slippers with this yarn and I love them. I love the variegated yarns and one of the slippers is made from the red, white and blue yarn. Perfect for the summer holidays.. I know barely nothing about crochet, knitting and all this stuff .. but so far i’ve managed to translate some patterns. my problem is that i dont get the number of stitches …. for the 1st row, if i’m correct, the slip knot count as stitch right ? and for the second row you count 10 stitches and for me 1 ch, 8 MS plus 2 MS on the sole = 11 stitches .. i dont want to mess the pattern so please can you lend me your help ? Thanks a lot for the feedback! I’m always trying to make my patterns clearer and easier to understand, so if there’s ever a specific aspect that trips you up, feel free to let me know so I can take a look at clarifying it. Are there any other patterns of mine that have you’ve found challenging to sort through? I do think that my specifically my flip flop crochet patterns tend to differ a bit from something from Yarnspirations, etc. 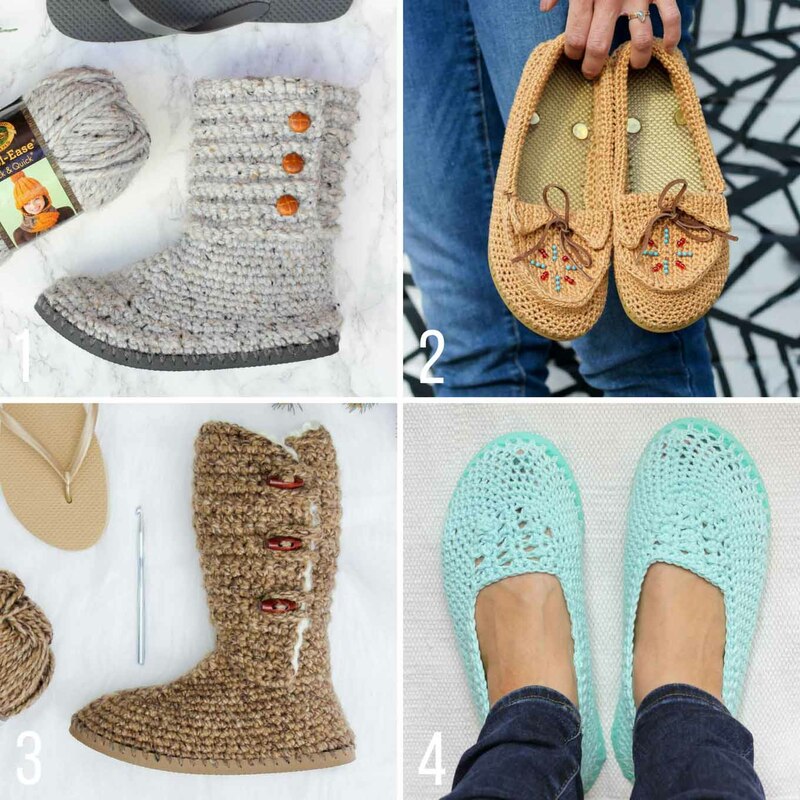 because I try to offer a sort of “education” on how to customize them so that crocheters can make something that works well for their specific feet. I realize though, that for dedicated pattern readers, this could be too much information and detract from the essentials of the pattern. I really appreciate hearing what your experience with them has been. Actually I just finished thus set, I purchased the instructions, for an easier read, and both boots came out beautiful! The one I had the hard time following was the wool winter boots, but now that I’ve tackled these no problem I think that I may revisit the wool boots again. After doing this pattern with no trouble, I think it was more of a me problem than a your direction problem. Part of what tripped me up with the wool boots was the video, I’d keep referencing back to it and seeing mine looking different than yours. I noticed part way thru the wool boot design too that if you stopped at one point you’d have a perfect slide on slipper, I’m sure you noticed whole making yours. How about a soft slide on slipper patten? I’d love to see one! Oh and thank you for the patterns, they’re so cool, so creative and just so awesome! Thank you, Sara, for such a kind note and for telling me about how you’ve used my patterns! I love hearing that you expanded your skills and figured something tricky out–isn’t that the best feeling? I totally agree! I think the foundation of this pattern could make a wonderful slide-on house slipper. That could be a great pattern for the fall. Thanks for the idea and for following along with Make & Do Crew! My 13 year old daughter loves these boots but she wears a size 12 shoe (she is super tall). We can never find cute shoes in her size, so I’d really like to make these for her. I’m overwhelmed with the thought of trying to adapt your pattern to a larger size. Any guidance you can give me would be greatly appreciated!!! This should actually be pretty easy to adapt! 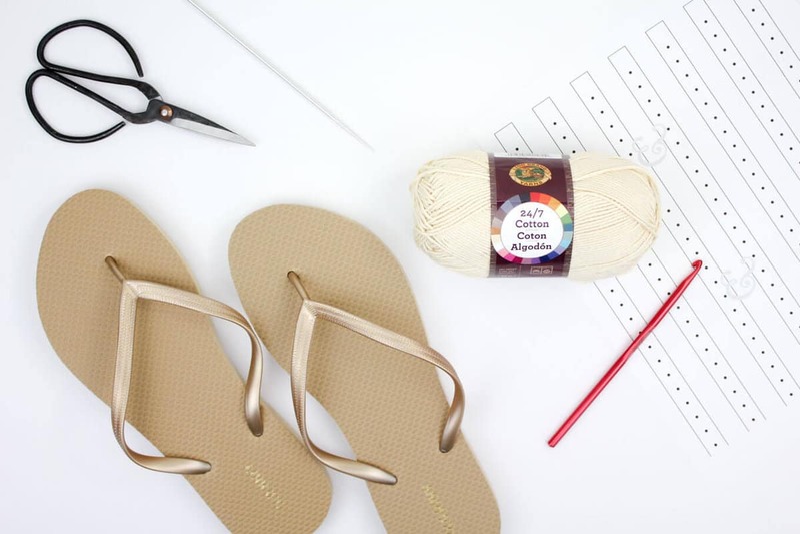 Since the number of holes always varies based on the flip flop size anyhow, just follow all the instructions as written in the pattern for the largest size to begin. Then I think you could repeat this row twice to add approx the appropriate amount of length to the toe section. If your daughter has fairly average sized calves, everything else about the ankle should work as written for the largest size. If you give that a try and have questions, just let me know! I sent you an email but I don’t think it got to you. I have two questions – the first is the little one; are the “knit mitts” really knitted and not crocheted? Do you have a crochet version? Second, I am TOTALLY fascinated by the idea of making my own shoes/boots on top of flip-flops! 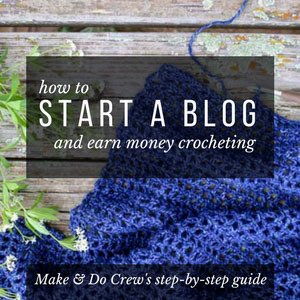 And I’d much rather pay you directly than have to read around the ads… but when I went to the “buy here” link, it seems as though every pattern took me somewhere else – Craftsy, “Love crochet” , and so on. Is there a way to just buy the pdf patterns directly from you? If it will help, I’ll put at the end of this email a list of the patterns that I am looking at. I’m sorry–I think the knit mitts must be an old pattern because I can’t remember what you’re referring to! 🙂 Please feel free to share the link here and I’ll let you know if I have anything similar. I bought the kit from Lion Brand yarn and did not receive the hole poking guide. Would be nice if it were added into the kit. Question concerns the Coachella boot slipper. Try as I might I cannot figure out how one arrives at the sts as you do for ea row. How do you arrive at 10 sts from a chn 1 and 8 sts? I get row 2, but back to confused on row 3. I only come up with 10 sts. If you or someone else who has completed the slippers could explain, I \sure would appreciate itf! That sounds really nice! I haven’t made any with flip flops like that, but I imagine most of the process would work exactly the same. You would still poke the holes about .25-.3″ from the top of the sole, so you’d kind of just pretend that that thicker sole wasn’t down below. Does that make sense? Hi there. This pattern is gorgeous but I’m really struggling with it. Would it please be possible for you to make a video. I tried following the other grey boot video and adjusting it to this one but it just turned out all funny. Please please can you make a video?